need help… How many blogs are there out there? We have some very savvy contributors and readers here at the TLF, so I am hoping that some of you can help me out regarding a data search I’m struggling with. I am seeking a definitive database of blog stats. I am hoping that somebody out there has been tracking blog growth regularly and has aggregated yearly data going back a few years. I want to chart this growth as part of my ongoing “Media Metrics” series, but I want to make sure that the numbers I am using are accurate. 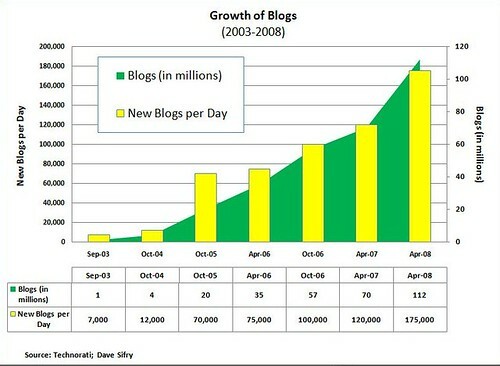 Since 2003, I have been relying on the occasional reports about the “State of the Blogosphere” that Dave Sifry of Technorati has been putting together. Lots of good info in those reports, but (a) it is not standardized (the totals are from random months); and (b) he stopped producing it last year (the last report is from April 2007). There are also other questions I have not been able to figure out: Should the totals include individual profiles at social networking sites? If so, how would they be counted? How are “splogs” (spam blogs) defined and factored (or not) into these totals? Should Twitter and other forms of “micro-media” factor in? Regardless, I have put together the following chart using the numbers from Dave Sifry’s old reports as well as the latest numbers that Technorati lists on the “About Us” tab. The latest number is an astounding 112 million blogs, and according to Technorati data, “there are over 175,000 new blogs (that’s just blogs) every day. Bloggers update their blogs regularly to the tune of over 1.6 million posts per day, or over 18 updates a second.” That’s impressive, but I would love to see if anyone else has competing numbers. Next post: Comcast to move to bandwidth cap / metering solution?